Sheet-Metal and Foamed in Place Polyurethane Construction. (3’ x 7’, 4’ x 8’, 5’ x 8’, 5’ x 9’, 5’ x 10’,) Polar Temp small refrigerated trailers feature a durable, attractive Ceram-A-Star® exterior finish that resists scratches and rusting or peeling, even in the harshest environments. G 90 galvanized interior are used because of their long-lasting strength and durability and well-known in the insulated storage container industry. Fiberglass, wood frame and other converted trailers are not as strong and durable and are not designed to withstand the rigors of the road. Additionally, wall, ceiling, and floor foam thickness is 3 inch giving an average 20.1 insulating R-value. The door and door frame area are 4 inches thick giving extra support in the area of the transport that gets the most abuse and gives the average of 26.8 insulating R-value. Sheet-Metal and Foam Expanded Poly Styrene Panel Construction. 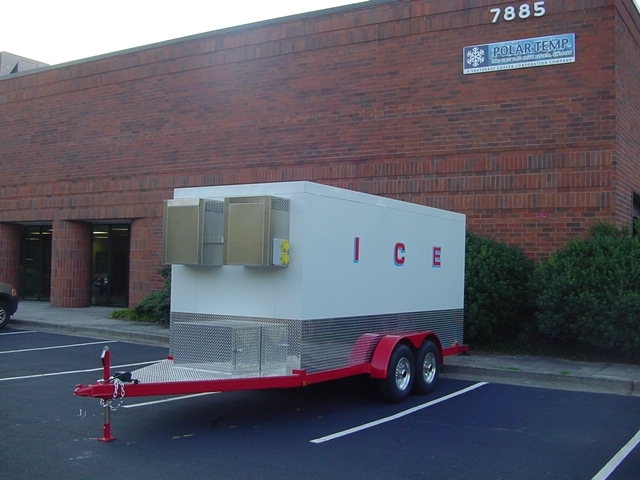 (7’ x 12’ and 7’ x 16’) Polar Temp small refrigerated trailers feature a durable, attractive Ceram-A-Star® exterior finish that resists scratches and rusting or peeling, even in the harshest environments. G 90 galvanized interior are used because of their long-lasting strength and durability these panels are securely joined at the wall joints with tongue and groove with cam locks and with (Very High Bond) VHB double-sided tape. 3M™ VHB tapes are high strength bonding tapes and proven alternatives to screws, rivets, welds, and other mechanical fasteners. Unlike screws or rivets-which join materials at a single point-high strength bonding tape permanently adheres one substrate to another while spreading the stress load across the entire length of the joint. Once the materials are joined with 3M™ VHB tape a virtually indestructible “weld” is created. Fiberglass and wood trailers along with other converted trailers may not be as strong and durable. Additionally, wall, ceiling, floor, door, and door frame foam thickness is 4 inches giving an average of 28.8 insulating R-value and delivering extra support at the area that gets the most abuse. Sheet-Metal Foamed in Place Insulated Doors with PVC Breaker Strips and Replaceable Gaskets. Polar Temp transport doors are foamed in place with a (Polyvinyl Chloride) PVC rigid profile recessed door opening adding strength and since it is foam insulated in a rigid foam’s fixture adds considerable strength durability and reliability. This is the same technique used by most large walk-in door manufacturers with years of experience. The door gasket is flexible PVC and is easily replaceable and cleanable. Some of our competitors compromise strength, durability, dependability, and reliability by using wood with sheet-metal interior and exterior door panels and offer no easy gasket replacement. The safest and most proven suspension system available comes with springs and equalizers. This allows all four tires to remain in contact with the road. All two axle trailers come standard with electric brakes. Easy lube hubs allow you to grease the bearings without disassembly. White painted corrosion-resistant wheels that exceed the rated capacity of the trailer are standard. Highest-quality tires are used to match trailer capacity. These properly matched accessories eliminate possibilities of sway. Wheels are fastened adequately with 6 or 8 lug nuts depending on the axle load capacity. All steel fender wells are welded in place then primed and painted forming a truly unitized fender. They are then securely bolted to the trailer frame. Heavy-duty 2” x 4” x 0.25” or 2” x 5” x 5/16” tubular steel main rails with 3” x 3” x 0.25” steel angle cross members combined to form a robustly constructed trailer frame.
. We wipe the trailer substrate with a high-grade grease and wax remover. Then we sand the trailer frame with 80 grit sandpaper and smooth areas such as fenders we sand with 180 grit sandpaper. Again we repeat the preparation process with a grease and wax remover. After the metal is clean and free of oil and other contaminants, we apply a corrosive resistant primer with a catalyst. And the final step is to apply the color topcoat with a catalyst of your choice. Our paint is a marine grade durable coating. A side or top wind tongue Jack with a foot rated at 7,000 lb static and 5,000 lb lift are located at the hitch allowing easy raising and lowering for the hookup and disconnect from your vehicle. 6-foot safety chains with hooks are provided in all trailers for safety. Signal, Stop and Marker Lights. A standard 7-pin trailer light kit is used and fits most new vehicles today. Another important safety feature is the break-a-way kit that in the event of the trailer coming detached from the vehicle, the break-a-way kit powered separately from the polling vehicle activates the trailer brakes. In order transfer hitch assembly stress into the main chassis and the superstructure, we extend the tubular steel “a” frame hitch to the front of the chassis where it is welded securely to the heavy tubular front cross member. The weight capacity of our trailer requires the use of a 2 5/16” ball. The steel tubes used for the trailer chassis incorporate radius corners that add strength and are an integral part of most edges on the trailer structure. The trailer bodies are mounted securely between the tubular frames of the trailer with. ½ inch diameter bolts. Robust ¼ inch aluminum angle wall bumpers are used at each side of the interior floor were bolts extend through the floor to the heavy angle iron supports of the trailer.